For people who aren't familiar with the name "Pathfinder", here's a bit of history for you, on why it's so cool. The creator of Pathfinder, Paizo, once published two official Dungeons & Dragons magazines for the owner of D & D, Wizards of the Coast. These two magazines offered fans all kinds of adventures to play, and articles on their favourite hobby. When Wizards of the Coast revoked that license, Paizo decided to pick on and create its own RPG for fans of its approach to the hobby. That RPG was Pathfinder, and it developed a really big following (especially when Wizards of the Coast attempted a MMO-style game in the fourth edition of Dungeons & Dragons, which was about as popular to D & D fans as Donald Trump is to anyone with a brain). What we haven't had yet is Pathfinder turned into a video game. There's a decent digital board game out there based on the property, but no true in-depth RPG. That's going to change with Pathfinder Kingmaker, and we are very, very excited about this. Pathfinder: Kingmaker will take players on a tour through the infamous Stolen Lands, the dangerous and turbulent territories well known within Pathfinder fandom. 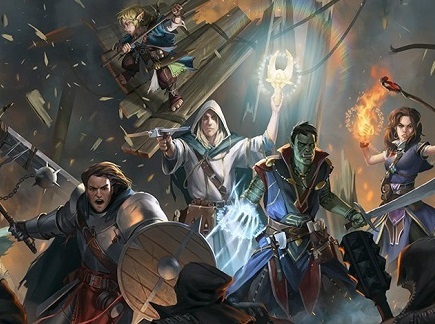 The computer RPG will revisit familiar characters and well-known locations of the series’ lore as well as treat players to brand new adventures, deadly foes and unforeseen twists and turns. Fans of the fantasy pen-and-paper RPG will experience its epic, heroic universe in new ways while computer RPG gamers will discover their favourite genre in a more contemporary light, in stunning 3D graphics that bring the universe to life. Pathfinder: Kingmaker will challenge players as both adventurers and rulers as they will be able to claim explored lands and carve their own kingdom from the wilderness. Kingdom founding will go beyond simple stronghold-building to become a true reflection of the hero’s character and choices made throughout the game. Each kingdom will be a living thing shaped by alignment, choices, allies and the hero’s ability to lead his or her people. The game releases on PC on September 25.